Gotta bundle up and keep as warm as you can during these cold months in Boston! But this popped collar wool coat, funky floral print scarf and plaid scally cap is a pretty fun combination for keeping warm and cute all at once. 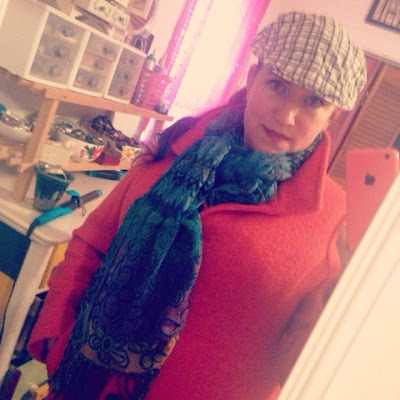 I mixed the pieces that an Irish grampa would wear (thick scarf, scally cap, wool coat) with all kinds of feminine things (bright orange and turquoise, curly red pony tail, pinup makeup) for a play on the Galway Look. Haha. The hat belonged to my father. I bought it for him at Old Navy and then I got it when he passed away. Coat is from Sears--Mom bought it for me for Christmas last year. And the scarf was a gift from Mom as well. Look at that, the parents making sure I'm bundled up for winter even though one is in New Orleans and the other is where-ever we go after we are done being on this planet. So comforting!